Mrs. Withrow's used a pattern to make a canoe out of brown construction paper. The children made rubbings from the bark of trees to give an authentic look to their canoes. 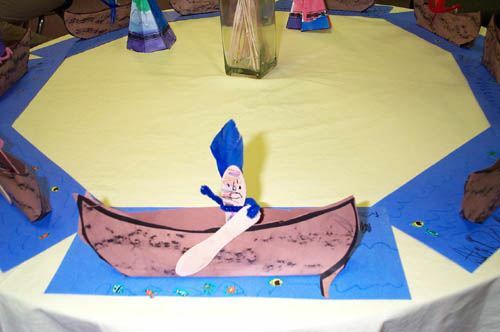 The paddle and the rower are made of wooden ice cream sticks, and the base on which the canoe sits is blue construction paper. A real feather makes the head dress. Press "Go" to search for American Indians.